Soft Honeycrisp apple slices sprinkled with cinnamon and wrapped up in an apricot-preserve brushed croissant. 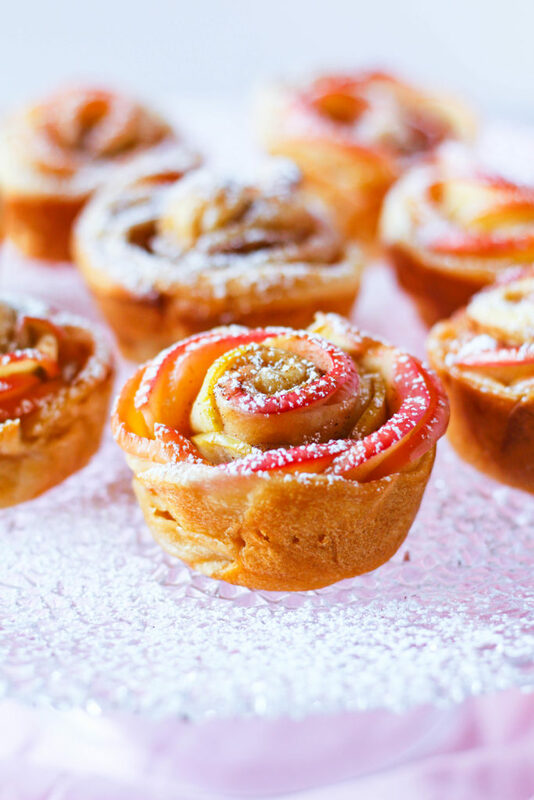 These Honeycrisp apple roses are beautiful and impressive, yet very easy to make. Make a batch of Honeycrisp apple roses for your Valentine this year. Oh, these Honeycrisp Apple Roses! So beautiful. Sweet apple slices, cinnamon and apricot preserves, all wrapped up in croissant dough? Heavenly! They look harder to make than they really are. All you need is a croissant sheet– they sell the giant sheets of croissant dough in a tube in the refrigerated section of the grocery store. This allows you to slice into the sizes you need. I created eight strips of dough for these roses. 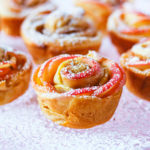 To make, you simply slice, brush with apricot preserves, line with microwave-softened apple slices and cinnamon, roll up and place into a muffin tin to bake. The apples soften in the microwave and then in the oven and come out just right– slightly soft which contrasts nicely with the flaky croissant dough. You don’t need any sweetener for these roses, except for the powdered sugar sprinkled on top. I chose Honeycrisp apples because they’re known for their sweetness, firmness, and tartness — perfect for baking. 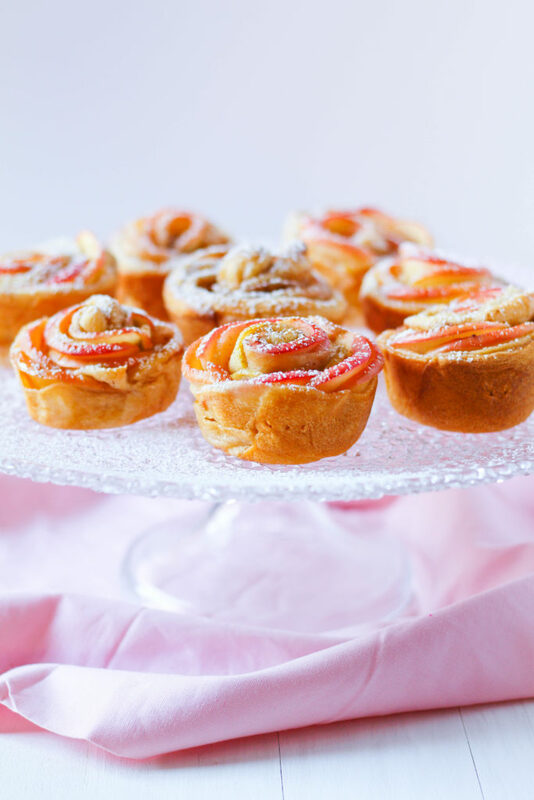 These honeycrisp apple roses are simple to make and don’t take much time! I had a blast photographing these. They were so photogenic from every angle. I had 20 pictures in this post that I had to cut down, haha. These can be served any time of day: breakfast or dessert. We had them several times this week for dessert after dinner. I added a scoop of vanilla ice cream and a drizzle of caramel syrup. If you make a big batch of these, refrigerate the leftovers and just re-heat them in the microwave. They’re like cute little apple pies wrapped up to look like a rose. I hope you all have a wonderful Valentine’s day! Soft Honeycrisp apple slices sprinkled with cinnamon and wrapped up in an apricot-preserve brushed croissant. 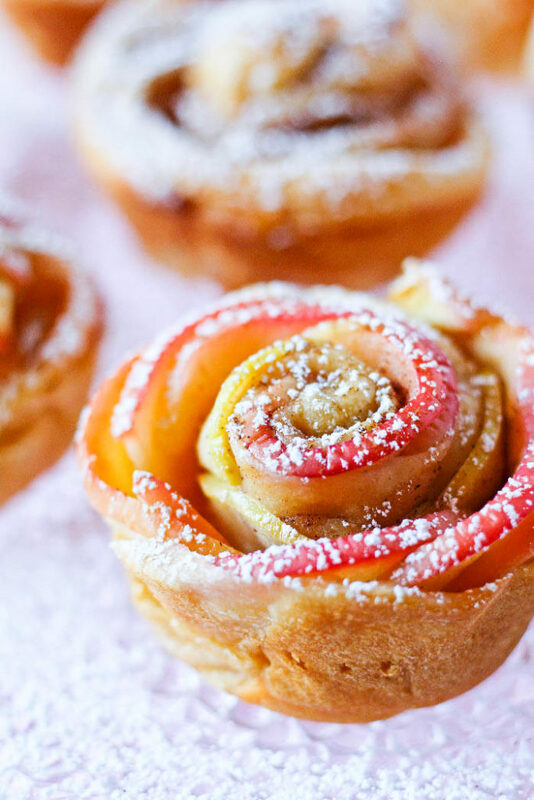 These Honeycrisp apple roses are beautiful and impressive, yet very easy to make. Preheat your oven to the temperature on the back of the pastry sheet package. Slice the apples thin with a mandolin, about 1/6 of an inch. Place in a bowl and cover with water and the juice from a lemon. Microwave for 4-6 minutes, until the apple slices bend easily without snapping. Roll out the croissant sheet over a surface sprinkled with a little flour. Use a rolling pin to make it thin. Cut dough in half vertically and then four times horizontally (to create 8). Place the apricot preserves in a small bowl and add a splash of water. Microwave for 1 minute and whisk together. 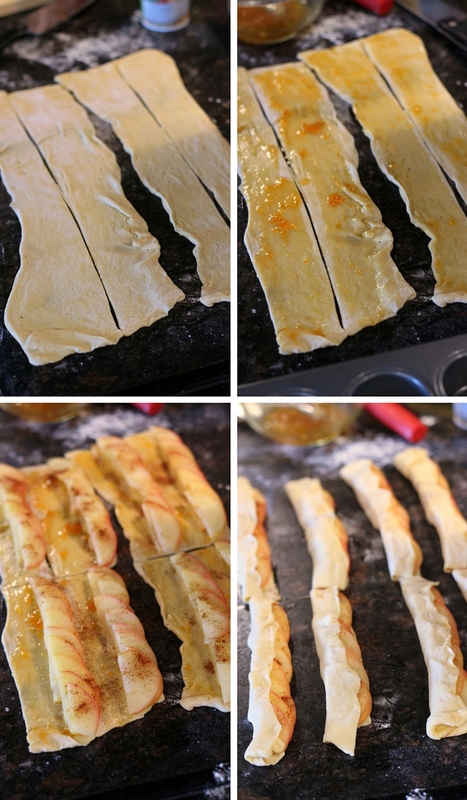 Use a pastry brush to brush the apricot preserves onto the dough. Line the apple slices at the top of each dough slice. They should be peeking slightly over the top of the dough. Sprinkle with cinnamon and then fold the bottom edge of the dough over the apples. The apples should still be peeking out slightly. Roll the dough pieces inwards, creating spirals. Place into a greased muffin tin and bake for 10-15 minutes, until dough is golden brown. Serve with a scoop of vanilla ice cream if you please! No way – I’m making these today with my 8 year old! I saw a recipe a few weeks back on Healthy Aperture and then the video a few days ago – glad to see they aren’t too hard and they look wonderful!! Yours turned out so great, saw the pic on Twitter! YUM! These look absolutely gorgeous!! You made it look so simple.. I feel like I would have a very hard time with making these- LOL! Give it a try, it’s easier than it looks :) Just slice and roll and bake! Thank you! :) They were pretty and tasted just as good :) Hope you had a Happy Thanksgiving as well! These are absolutely gorgeous! And such a delicious flavor combo too. Sounds divine! Happy Thanksgiving and good luck with your first turkey!! Thanks, the turkey turned out really well! Well see this is just one of those recipes you have to pause and gaze at the beauty….and then devour! Delish and beautiful! My favorite kind of holiday recipe… deceptively simple for such wow-factor! Beautiful! How did the cream cheese version turn out?